Surprise your friends and family with a delicious Thai appetizer or ​party food treat! Your guests will be 'wowed' when they bite into these fresh and oh so flavorful finger foods - excellent whether served on their own or paired with your favorite cocktail, lager, or wine. 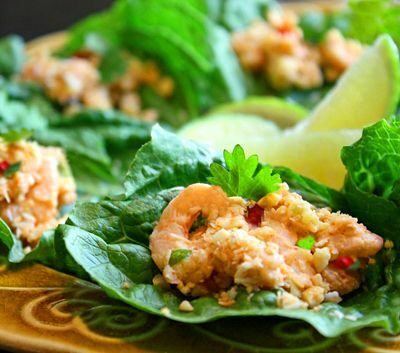 If you and your friends like spicy, zesty foods, try making up a platter of these Thai Shrimp Mini Lettuce Wraps! These bite-size wraps are just perfect for a party finger food. Each mini wrap provides a burst of Thai flavors that are meant to hit different parts of the palate all at once, awakening your taste-buds and sending you straight to food heaven. These are some of the best crispy fried wings ever, and they're easy to make too. Unlike most deep-fried ribs, these are not just about the coat, but ​the full flavor all the way through. The special Thai marinade is what does it -- a special concoction of coriander and garlic that is whipped up in just minutes. Satay is a huge hit with any crowd, as well as a special taste treat for your family. This recipe is straightforward and not hard to make, with results that will be sure to impress your guests. While most Western versions of peanut sauce are made with peanut butter, this Thai peanut sauce recipe starts with real peanuts - and you'll taste the difference! This peanut sauce can be used for a variety of purposes, from a dip for veggies to a sauce for chicken or beef satay, or use it to make a yummy cold noodle salad. This Thai version of fried calamari is crisp and delicious, and you won't believe how simple it is to make. If you're a fan of Greek calamari, you'll love this recipe. Makes a fantastic appetizer or party food, or serve it with a Thai salad and you have a complete meal. This spring roll recipe can be made vegetarian with tofu, or with baby shrimp if you prefer. Brimming with vegetables and lots of flavor, these spring rolls make a great appetizer or party food. Plus, they're far fresher and healthier than the spring rolls you'll find in most restaurants. This scrumptious recipe for corn fritters is a real treat that will make everyone happy, even kids. It's also vegetarian and can be made gluten-free. The batter takes only minutes to stir together, then just drop spoonfuls into hot oil and fry a few minutes for the yummiest savory fritters ever. Unlike most coconut shrimp recipes which are deep-fried, this one is easily baked up in the oven, which means less fat and calories. Excellent served with Thai sweet chili sauce. This Dragon Fruit Martini is easy to make and beautiful to serve! Your guests will be surprised and delighted by this refreshing cocktail, and the marvelous-looking dragon fruit also makes a great conversation starter! Dragon fruit is native to Thailand but is now readily available throughout North America. These Thai-style fresh rolls are fun to make and so scrumptious! They are often called 'fresh spring rolls' or 'fresh summer rolls' - in other words, they are excellent served in the spring or summer, when fresh lettuces and herbs are available. These Thai Mussels make a beautiful gourmet-style finger food or appetizer, and they're easy to make too! The curry sauce is created right in the pan, so you don't need to bother with curry paste or even a food processor. If your mussels are already clean and ready to go, this dish can literally be served up to your friends in just minutes. Enjoy as is, or add a loaf of crusty French bread on the side to soak up the yummy sauce. While gourmet, this appetizer is surprisingly easy to make - the cooking time is literally 10 minutes! If you like seafood, you're going to fall in love with these melt-in-your-mouth scallops, as well as the sumptuously simple sauce that accompanies them. Lettuce wraps are fun to eat with friends, and they can be part of the making of them. Just stir-fry the hot filling, then set on the table together with the lettuce and toppings, and let everyone make their own. Imagine biting into a succulent deep-fried shrimp covered in a light tempura-like batter flavored with the taste of coconut - scrumptious! This Coconut Shrimp recipe is fantastic to serve as an appetizer, tapas plate, or party food. As a bonus, this coconut shrimp recipe includes instructions for a gluten-free version so no one has to miss out. This wonderful Thai shrimp recipe is easy to make and superb for a party. Medium to jumbo shrimp are tossed in a spicy chili-garlic sauce, then broiled in the oven for just a few minutes. Add toothpicks and serve as a party food, or enjoy with rice as a main entree. This spicy shrimp recipe will be a hit with your friends and family, and it's ready in less than 30 minutes! This Thai ribs recipe creates tender, tangy-sticky ribs. Makes a terrific finger food for a party, but be sure to make lots, as they'll be gone in minutes! Thai Fish Cakes are a common street food in Thailand and are very flavorful compared to most Western fish cake recipes. Accompany these cakes with Thai sweet chili sauce for dipping, fresh coriander, and a squeeze of lime juice. Simply delicious! And since they are much smaller than Western-size fish cakes (more like mini cakes), they're perfect for serving at a party with drinks. These easy-to-make crab cakes are guaranteed to melt in your mouth! You and your friends will definitely be wowed by how deliciously moist they are - not be mention imbued with wonderful Thai flavors. This crab cake recipe makes an elegant appetizer, finger food, or entree to serve guests, but is also easy enough to cook up as an everyday treat. This Mango Sauce/Dip is easy to make and gets rave reviews. A little coconut milk helps enhance the mango and give it a rich tropical flavor, while a touch of lime juice keeps it on the savory side. This Mango Martini recipe is the real deal, made with fresh ripe mangoes for the absolute best mango flavor. This exotic martini makes a great drink to serve guests at a party.